Have a campfire ring? Great! Need to dig a campfire pit? No problem! Most established campgrounds have fire rings. 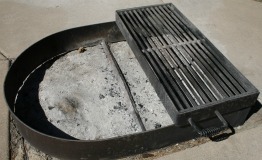 A fire ring is a circular steel plate, with a removable grilling grate and/or griddle to cook on. A fire ring is usually above ground but some older types may be sunken into the ground. The ring helps shield from the wind when starting the fire. The only drawback is the lack of oxygen when starting the fire and not being able to blow on the fire easily if you need to. Campfire ring with attached grill. If the campfire ring is too full with old cold coals, it's better to remove some of them first, before you build a fire. Check to be sure there are no hot coals. The easiest way is to throw a leaf on there. If it doesn't shrivel up after a couple minutes the coals are most likely, cold. The perfect campfire on a cold night. If the coals and ash are cold, grab a shovel and a plastic grocery sack and fill the bag with the cold coals. Be sure to place the bag in a metal trash bin, just to be on the safe side. If there is no trashcan nearby move the old coals to the ring's center. It's easier the build a fire with the old coals away from the outside of the ring. Also, check is to see if the ring has a gap around the outside of the ring above the ground. Having that small gap will give your campfire adequate oxygen from underneath which will make the fire start and burn much easier. If the gap is covered up with old coals, take your shovel an move them to the center of the ring and build a fire on that. The ground is level, we’re out in the open and not under any low hanging tree branches. Now that the ideal location to build a fire has been found, it’s time to dig a campfire pit. Everyone has their own thoughts on how to make a campfire pit the “correct” way. I have my own method as well. I’ll explain mine, give reasons for it, and you can decide whether or not it works for you. Since the ground may be different where you are camping. Feel free to use this how to build a fire method, and adapt it to your particular situation. If the ground is really hard, even if your pit is only a couple inches deep, it will still help contain the fire. In this how to build a fire section the focus to make a simple and safe campfire with less impact on the environment. With a stick or shovel, draw a circle on the ground about 2 ft (60 cm) across. Dig out the center of the circle 6-8 inches (18 cm) deep. Place the excess dirt or sand, in a pile, around the outside of the circle. If the ground contains a lot of loose dirt the pit may need to be larger than 2 ft wide since the hole will want to fill itself back up. Important note: Be aware of any roots that may show themselves when digging a fire pit. These can also burn a long time underground, after the main fire has been extinguished, and cause a forest fire a couple days after you’ve left the campsite. If the roots are not too, big I’ll pull them out, otherwise I’ll chop them out with a hatchet. An often seen build a fire method used is to line a bunch of rocks around the outside of a campfire. I prefer not to use this popular method, unless the rocks are already in place. Or, at most I’ll use 4 rocks if I need for cooking grill support. Those charred rocks will remain black forever! Also, by not collecting rocks, the surrounding areas remain less disturbed. Important note: Another reason I tend not use rocks around my campfire. Rocks can explode if they get too hot! I had one explode once. It was a large round river type of rock. It is possible that any trapped moisture inside a rock, turns into steam or gas, and expands when heated, which fractures the rock. It doesn’t happen often…but it does! It’s just a good thing to know. Making the pit 6-8 inches deep helps keep the fire contained. The circular shape helps keep oxygen flowing to the campfire. Extinguishing the fire is also very easy when using a fire pit like this. When the water is poured in it does not run away carrying dirty ash with it to surrounding areas. In places where only rocks were piled up around a fire in a ring, there tends to be a big dirty, dusty mess. By having the dirt piled up around the pit makes it very easy to fill up the fire pit with that dirt after the fire is fully extinguished. Hence there is a lot less impact on the environment! The idea is to make the area appear as if nothing was disturbed. Here at the camping detective we hope any of these how to build a fire ideas will help you. If you're done with the build a fire section you can learn more by reading about campfire wood. Back to the "make a fire" homepage. 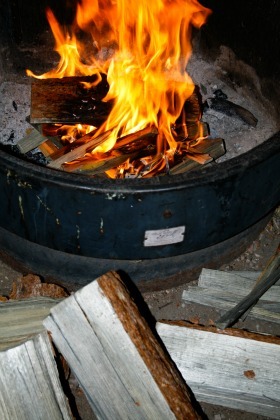 Discover how to build a campfire after preparing some campfire wood.